I'm coming in a tick [two ticks]. すぐ行きます. What makes him tick? 彼はどういう動機からあのようなことを言う[する]のだろうか. The clock was ticking away the seconds. 時計はカチカチと秒を刻んでいた. She ticked off the items one by one. 彼女は品目をひとつひとつ照合した. give a person tick 人に掛けで売る. The taximeter was ticking away mercilessly. I want to know what makes her tick. The minutes ticked away as I waited. A regular, rapidly recurring signal emitted by a clocking circuit. From Middle English tyke, teke, from 古期英語 ticia (“parasitic animal, tick”), from Proto-Germanic *tīkkô, suffixed variant of Proto-Germanic *tīgô, compare Dutch teek, German Zecke. A tiny woodland arachnid of the suborder Ixodida. A relatively quiet but sharp sound generally made repeatedly by moving machinery. The steady tick of the clock provided a comforting background for the conversation. A mark on any scale of measurement; a unit of measurement. At midday, the long bond is up a tick. (computing) A jiffy (unit of time defined by basic timer frequency). (colloquial) A short period of time, particularly a second. I'll be back in a tick. (birdwatching, slang) A lifer (bird seen by a birdwatcher for the first time) that is uninteresting and routine, thus merely a tick mark on a list. The whinchat; so called from its note. To make a clicking noise similar to the movement of the hands in an analog clock. To make a tick mark. (informal) To work or operate, especially mechanically. He took the computer apart to see how it ticked. I wonder what makes her tick. To strike gently; to pat. Stand not ticking and toying at the branches. A sheet that wraps around a mattress; the cover of a mattress, containing the filling. He paid his mother-in-law rent and, when the baker or the butcher or the grocer wouldn't let her have any more on tick, he paid the bills. To go on trust, or credit. To give tick; to trust. From Middle English tik-, tic-, tike-, tiken- (in compounds), an unassibilated form of Middle English tiche, tichen (“young goat”), from 古期英語 tiċċen (“young goat; kid”), from Proto-Germanic *tikkīną (“goatling”), diminutive of Proto-Germanic *tigō (“goat”). Cognate with regional German Zicke (“nanny goat”), from Ziege (“goat; nanny goat”). (obsolete, place names) A goat. Nowadays only found in place names. Fell out of common usage in the 13th century. 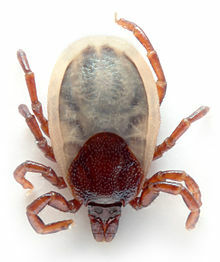 Tick is the common name for the small arachnids in superfamily Ixodoidea that, along with mites, constitute the Acarina. Ticks are ectoparasites (external parasites), living by hematophagy on the blood of mammals, birds, and occasionally reptiles and amphibians. Ticks are vectors of a number of diseases, including Lyme disease, Q fever (rare; more commonly transmitted by infected excreta), Colorado tick fever, tularemia, tick-borne relapsing fever, babesiosis, ehrlichiosis and tick-borne meningoencephalitis, as well as bovine anaplasmosis.